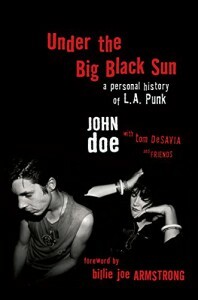 A very enlightening history of the early days of the LA punk scene, told by the people who lived through it - John Doe and Exene Cervenka of X, Jane Weidlin and Charlotte Caffey of the Go-Go's, Henry Rollins of Black Flag, members of other local bands and others who acted as journalists and photographers who captured that brief moment in time before punk became infamous. I was just becoming socially aware as the events described in the book came to an end, so the punk scene which had evolved by then was vastly different (thanks O.C.!) from it's humble origins. Punk wasn't a type of music, it was a form of artistic expression. It didn't seem to matter if you knew how to play or could carry a tune, as long as you had a message. There was one memorable passage where someone described how each performance was unique because they were literally lacked the skill to play their songs the same way each time. It was a very welcoming, inclusive, fun and expressive movement. Some of the writers recounted sadly how things changed when their tight-knit Hollywood community started being infiltrated by the violent intruders from Orange County. Others didn't seem to mind the change as much. In any event, by the time I came of age, the interlopers from Orange County had turned the LA punk scene into what everyone imagines when they hear punk - loud, fast, angry music, venues that were prone to violence, and a fan base that was looking to start trouble. If only I'd been five years older, it sounds like just the sort of thing I would have loved! But then again, given how much of a dork I was, I probably would have gotten into disco scene instead!